Today I’m honoured and delighted to have Tara Derrington guest post on the blog. She has written the following piece in response to an event she attended earlier this week: RTE Cruinniú na Cásca panel discussion: The Forgotten Women of the Arts in Dublin Castle. I’ve been listening to a year and a half of feminist debate. Where are the women? Why are women not represented in the arts? What can explain the gender imbalance? We agree. It’s the patriarchy. We live under a patriarchal system that excludes women. What’s to be done? We need more female playwrights. More female directors. More designers. More female musicians headlining. More women on the radio. But where are they? Yesterday I listened to another panel take umbrage at the suggestion that the female artists are not there because they do not exist. It is unacceptable to say there aren’t as many female artists as male ones. 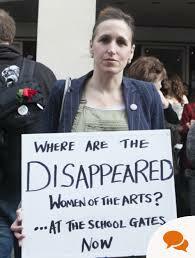 Again I hear the answer: The women artists are there but they are not given a chance , the patriarchy overlooks them. They are marginalised, other. They’ve had to move away from our shores in order to succeed. Look harder patriarchy. Once again I feel the elephant. She’s sitting beside me. She’s scattered around the auditorium. Over there she’s sitting with her children. She isn’t on the panel, on the stage. If her children are too noisy she will be asked to leave this debate. Regrettably her children may represent a health and safety hazard and are not covered by insurance. Sometimes this debate contains material that is not suitable for her children to hear. Often this debate takes place when she’s collecting her children from school. So she stays at home. The elephant isn’t in the room. I am tired. I do not speak. I do not speak the words because they are so breathtakingly obvious. There is gender imbalance in the arts because there aren’t as many female artists and makers as male ones. The patriarchy complains that they can’t find female artists to fit the bill. They’ve tried. They’ve called but there’s no answer. This is not a misogynistic smoke screen. Conveniently for the patriarchy, it’s the truth. There are more male artists and makers than female ones. Why? Because the patriarchy forces us to choose between becoming the carers of our families or sacrificing family life in order to continue as artists. Most of us can’t make that sacrifice. Yes I know some of you have children and you’ve managed it. I am glad for you. But I also need you to check your privilege. Explaining that you’ve succeeded despite your children is not speaking for me. It is possible to be an artist and a mother if you have guaranteed full time paid work, a reliable income provided by a partner, free childcare provided by family members, economic security in a world of sporadic low wages. If you’re prepared to put your children into childcare. You represent me but you do not speak for me. You don’t acknowledge the elephant. Sometimes it feels as if you’re ashamed of her, as if associating with her might associate you with failure, with lack of availability or commitment. We need you to ‘out’ yourselves as mothers and tell the truth about how you’ve managed to succeed while having kids. Maybe your husband helped you? Or your mother or your sister? Maybe you could afford an au pair, a childminder who could manage the school collections? Maybe your family has a regular income that is enough for you to survive? Maybe the wage you earned was greater than the costs of childcare. Maybe you could find childcare that was reliable, regular and that you trusted. This is the stuff we need to hear. Maybe it wasn’t just your talent or your hard work that got you through it? Telling the world that you had children and you still managed to make it in the Arts, against the odds, doesn’t help us or represent us. It makes us feel that we have failed. The children or the art? 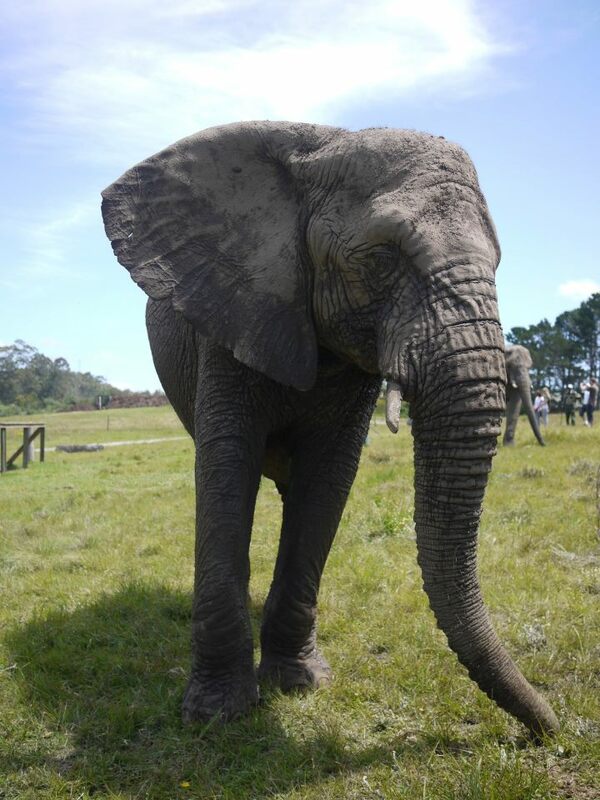 Mainly the elephant chooses the children. Sometimes she chooses not to have them at all; the ultimate sacrifice. I am so tired. I have shouted and I am not heard. Today I am out of Feminist breath. Until 2008 Tara was Co-Artistic Director of Living Space Theatre Company, directing You Are Here by Ioanna Anderson (Ulster Bank Dublin Theatre Festival), Play About My Dad by Michelle Read (Project Arts Centre) and The Other Side (Project Cube). She created/produced Living Space (Dublin Youth Theatre House) and developed/directed the improvised plays Human Stories 1-6 and St Agunas (Dublin Fringe Festival). Tara worked as a tutor on the Full Time Acting course for Gaiety School of Acting for ten years, directing their Graduation Showcase. She is the founder of GSA Youth Theatre Company. She has also directed stage shows for comedians Paul Woodfull (Ding Dong Denny O’Reilly), Joe Rooney (Batty Ryan) and Michael Downey (Standing Up Again). Following her two most significant Irish productions, her daughters Katya and Lucia, Tara’s work includes productions in Theatre Upstairs and The New Theatre, in which all her salary went on childcare. As a parent, her projects include Guerilla Housewives (A feminist discussion forum), The School Library (Role: The Librarian), Abolish Homework (A guerilla campaign to annihilate homework in Irish primary schools), The Road to School (A site specific, promenade piece documenting 8341 journeys up and down the same street) and Bedtime (Storytelling theatre with multi-character playing that has run nightly for 15 years). Tara founded Mothers Artists Makers (MAM) in March 2016 with Cerstin Mudiwa, Charlotte Harrison, Fiona Browne, Oonagh Mc Laughlin and Susie Lamb.